This product page shows a number of product images in the gallery module which users can click through. Under the image module is a description of the product. On the right is two paragraphs with facts about the product and underneath is a download module giving the option to download a fact sheet PDF. 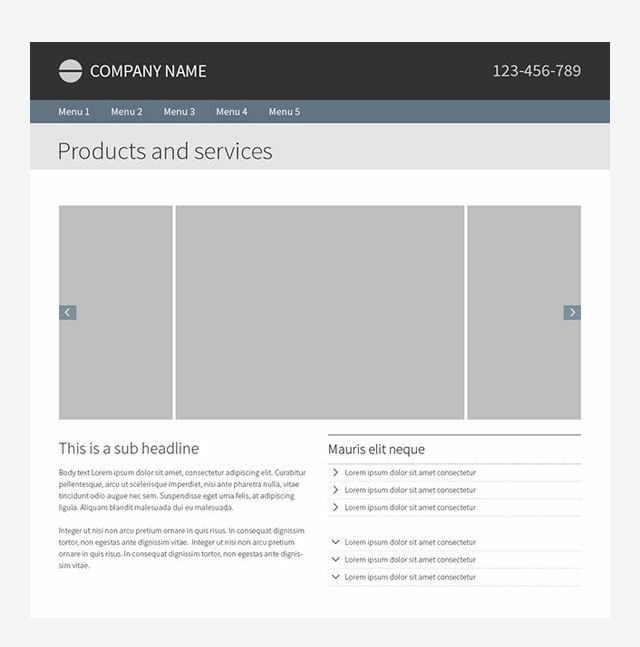 Above is an example of a product/ service main page template. At the top is a short introduction and underneath a number of image and text modules each describing and linking to a particular product/service. If you click on a product link it takes you to a single page where the product/service is further described. The page starts with a gallery module, making it visually appealing. Below the gallery is a descriptive text. On the right there is the link module and underneath these, a download module (can be used for PDFs about the particular product). Here is another example of a product main page. In this example there is a background image with a display text on top. Below that there is an introductory text to the section. Underneath are two teasers for products / services. The example product page underneath features an a large image taking the main real estate of the page with a small description below, followed by an image gallery. To the right is a small image as well as a few paragraphs of text. In this final example, the products/services main page starts with background image with a simple display text placed on top of the image. Below this are image and text modules providing a very visual way to navigate to product/service pages. Underneath this is an example of a product page using a simple image module followed by descriptive text underneath. Below this are three images and finally a download module for fact sheets or other relevant documents.